Have you started your Online Business yet? Yes? Great, how is it going? No? Why not? What is holding you back? Getting started is the most difficult part of any business and finding the right place to start can be a real challenge. So I thought I would create a series of posts to help you get started. So, lets dive in and get started right now! Step One – Getting Started! Platforms – expand and scale your business with repurposing and by using different platforms, on and off line. You need to decide what your online business is going to focus on. The options are very wide indeed but I will be focusing on just one as I think its the easiest way to get an online business started. My favourite of these is creating your own digital products based on your own expertise. We are all experts in so many topics and through the internet we can find literally millions of people who are prepared to pay you to share that expertise with them. So, your first step is to identify your own expertise. So what are you expert at? Evaluate your own skills based on your training and experience. Cast the net wide and consider everything in which you have any expertise. Remember the definition of an expert is someone who knows more than you do. There are some Evergreen topics for which there is always demand. Consider some of these – identify those in which you have existing expertise? Next I want you to focus on the PAIN that your potential customers are suffering from. Remember – pain sells! What do people around you ask you to solve for them? What do you know they need? What results to they want, but cannot achieve on their own? Once you have identified the topic on which you are going to establish yourself in, you need to plan your first digital product. Remember, you may be an established expert in your field already, what you need to do is to bring that expertise to your online audience and become known and respected as an authority in that field. Here are the key steps you need to follow. To be successful you need to have a portfolio of courses and digital products to offer to your students. You want to build a student body who know, like and trust your courses and to whom you can cross sell. 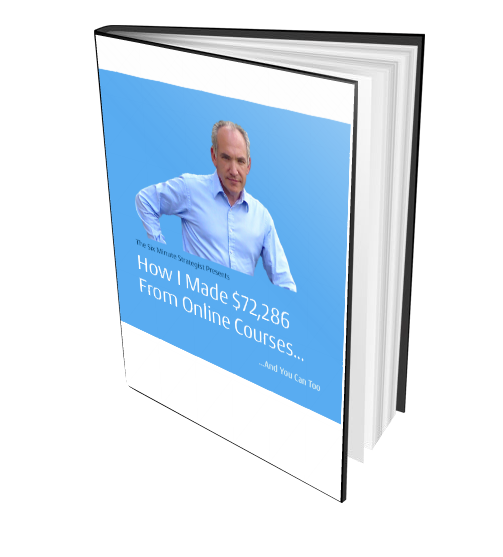 Once you have created some core courses, I recommend that you create several 30-45 minute niche courses which relate to your existing core content. You can cross sell these to your existing students. Create courses which address a pain or problem for your students. Be specific, have a clear end objective for the course. General “theoretical” courses do not compete well against courses which are addressing specific student needs. Review the Competition – What are other experts in your field doing? Remember above all your students are asking, Whats in it for me? Consider your product/course price and related the length and quality of your content to the price you plan to charge for it.